This elegant stackable band is constructed with 10-karat white gold and features milligrain detailing. This exquisite anniversary style wedding ring has a total of 0.16-carats of 21 round cut black diamonds. This band is sure to warm the heart of that special someone in your life. It is a twist of uniqueness for a vintage style ring. All weights and measurements are approximate and may vary slightly from the listed information. *T.W. (total weight) is approximate. 1/6 carat T.W. may be 0.13 to 0.18 carat. Treatment code G (black Diamonds). See Treatment Guide for further information. I love the ring! My husband got it as my wedding band and it goes perfectly with my engagement ring. You can find the set sold together and they work wonderfully together. You can try to have the engagement ring with a different band, but it just doesn't do it any justice. This ring compliments the Main ring beautifully. The only thing is that the stones on the side poke out a little more than the rest. At first it is a little uncomfortable, but to achieve the look, I have gotten used to it. Love love love this ring! It was purchased as the wedding band to match my Miadora 10k white gold Created white sapphire and 1/4ct TWD black diamond engagement ring. The stones are slightly smaller but it is still a great match! It provides the vintage look i was seeking and I recieve compliments on it almost daily. Also..the white sapphire still sparkles like new 3 year later! Other reviews talk abt the stones being scratchy but i havent had that problem with mine. No regrets! I got this as a gift for someone and she loves it. It matches with the "Miadora 10k White Gold 1 1/4ct TDW Round Black Diamond Ring" perfectly. I highly recommend these 2 for some spread out gift planning. They look amazing together as well. 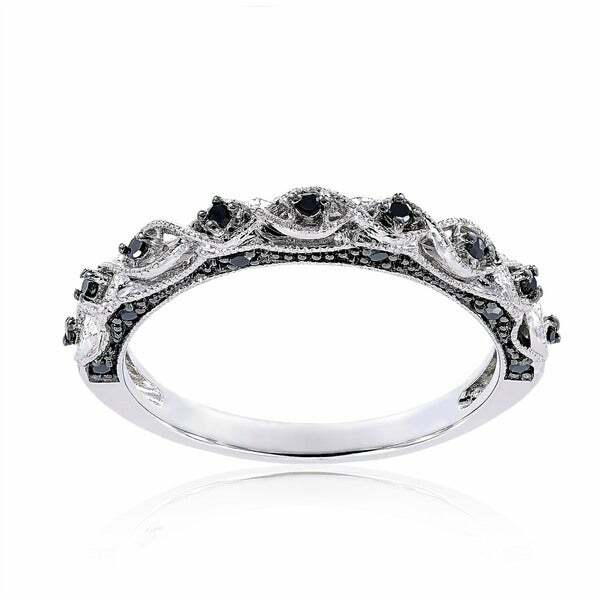 I bought this to go with the Miadora 10k White Gold Created White Sapphire and 1/4ct TDW Black Diamond Engagement Ring, because I wanted a "vintage look" and this definitely delivered. Pairs beautifully with the other ring, and is stunning in a very simple, dainty way. Only giving 4 stars because the prongs are a little sharp. 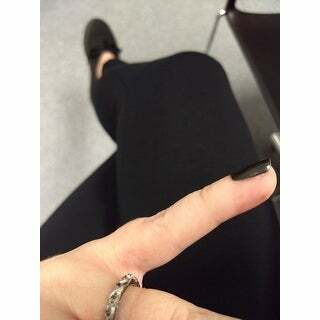 I purchased this ring to go with the black solitaire diamond ring that also has the same matching band. I liked it so well that I also purchased a second one so that I can use them as stack-ables with the black single diamond ring that also has the same band. I wear them everyday. 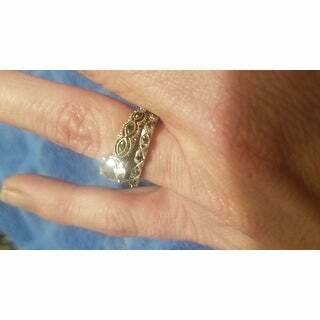 This band is lovely and detailed, however, I returned this band because I didn't like how it felt between my fingers. It was uncomfortable and it caught on things. It is beautiful ... slightly smaller in scale to the wedding set that it resembles but still makes a fantastic set. I imagine as a stackable would be gorgeous! Love this ring!! 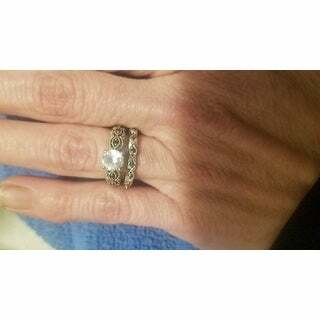 It’s elegant and timeless vintage look is what drew me to purchase this ring. It has just the right amount of diamonds to sparkle and it fits nicely with the 2 1/2 c. Diamond engagement ring that I purchased. It's beautiful. But it was very sharp, cut inside of my pinky where it rubbed , it didn't get better as I wore it. Simple and elegant. Can be worn alone or with another ring. I love the look of this ring and I'm so terribly disappointed that it's too painful to wear. I'm planning on returning to purchase a different band to go along with the engagement ring. The prongs around stones are so sharp it actually cut into my pinky finger. Again, beautiful band and matched excellent with the engagement ring but not worth the skin off my pinky finger. Great gift for my wife, she absolutely loves it. Great fit and goes well with her current engagement ring. The tiny diamonds make it easy to snag on clothes but she's very careful with it. It was very pretty and the size was perfect! "I LOVE this ring! Do you have it available with blue sapphires?" "Is it possible to order this in 18k white gold?" "Is this ring identical to the wedding band listed in item #14811896 or is it slightly different? 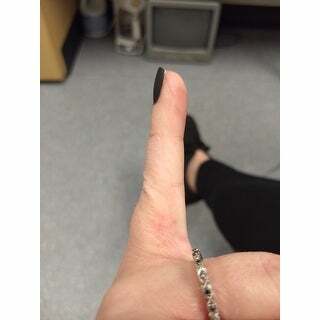 I bought 14811896 last year and would like to get this as an addition to 14811896 and was wondering if the ring lays flat or is slightly curved?" 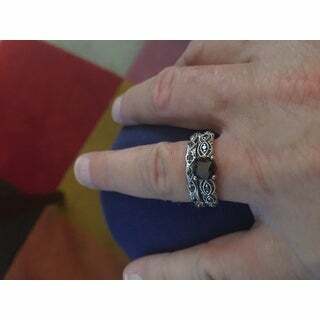 Hello Jeremy R., that is the matching wedding band, it looks a little curved because of the design, but it lays flat against the engagement ring. Have a great day! "Hi , Does this go with ITEM# 13683551 or ITEM# 15870275 better ?" Hello Rford717, I would suggest item number 15870275 to go with this lovely band. Thanks for shopping with us! "Does this ring come in Rose gold?" Hello helloretro, unfortunately, we do not have this in rose gold. Thanks for shopping with us! "Does this band fit securely together with the ring?" Hello Christy, we can appreciate the fact you want a firsthand account of the product. You will receive an email notification every time you get a response. Please provide an Item Number for the ring you would like this paired with so we can compare the items together. Thank you for shopping with us. I've lost a large amount of weight recently and none of my rings fit anymore I chose this one to go with a black engagement style ring in this order. I'm not sure about black diamonds but it looks so pretty I want to try it. This ring is also beautiful.